A geoscience and technology news round-up. If you spot anything we can highlight next week, drop us a line! On Earth and Mars alike, when earthquakes (or Marsquakes) occur, they send energy into the planet's interior that can be used for tomographic imaging. Because the positions of these natural events is never known directly, several recording stations are required to locate these data by triangulation. The earth has an amazing array of stations but not Mars. Nick Teanby and James Wookey, geophysicists at the University of Bristol, UK (@UOBEarthScience on Twitter), invvestigated whether meteorite impacts on Mars provide a potentially valuable seismic signal for seeing into the interior of the planet. Because new craters can be resolved precisely from orbital photographs, accurate source positions can be determined without triangulation, and thus used in imaging. Investigation showed that seismicity induced by most meteorites is detectable, but only at short ranges, and good for investigating the near surface. Only the largest impacts, which only happen about once every ten years, are strong enough for deep imaging. Read more in their Physics of the Earth and Planetary Interiors paper here. Image credit: NASA/JPL. Seismic processing company, Geomage, has joined forces with Petro Trace Services in a move to become a full-workflow seismic processing service shop. The merging of these two companies will likely make them the largest geophysical service provider in Russia. Geomage has a proprietary processing technology called Multifocusing, and uses Paradigm's software for processing and interpretation. Click here to read more about the deal. Google Earth now contains bathymetric data from more than two decades of seafloor scanning expeditions. 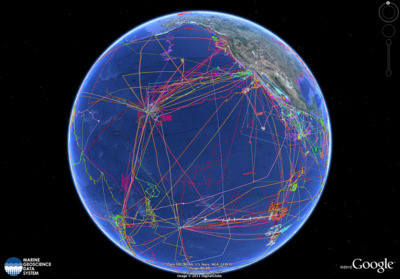 The update was released on World Oceans Day, and represents 500 different surveys covering the size of North America. This new update will allow you to plan your next virtual underwater adventure or add more flair to your envrionmental impact assessment. Google Earth might have to seriously reconsider adapting their streetview name to what,... fishview? Wired.com has a nice demo to get you started. Image: Google Earth. The AAPG's Petroleum Technology Transfer Council, PTTC, is having a workshop on open source software next week. The two-day workshop is on open software tools and reproducibility in geophysics, and will take place at the Houston Research Center in west Houston. Matt will be attending, and is talking about mobile tools on the Friday afternoon. There are still places, and you can register on the University of Texas at Austin website; the price is only $300, or $25 for students. The organizer is Karl Schleicher of UT and BEG. This regular news feature is for information only. We aren't connected with any of these organizations, and don't necessarily endorse their products or services. Image of Mars credit: NASA/JPL-caltech/University of Arizona. Image of Earth: Google, TerraMetrics, DigitalGlobe, IBCAO.